...Will Cronulla wreak revenge on Canberra? Way, way back in the second week of March, Canberra opened its season by humiliating Cronulla 40-12. Since that time both teams have endured lengthy periods of mediocrity, before latterly finding form. The Sharks finally get a chance to avenge that abominable performance when they host the Raiders this weekend. Cronulla is on a three-game winning streak. Last weekend it played very well against Souths, with Luke Douglas starring. He will have Paul Gallen for company as they take on the Raiders’ monster pack. Canberra was ruthless against the Roosters last Monday, a win that keeps them in contention for the semis. It was highlighted by another eye-catching performance from 19-year-old backrower Josh Papalii who scored a try, broke seven tackles and stung in defence. This should be an entertaining contest. The loser will find it very hard to secure a September berth, but the winner will gain even greater momentum. We like Cronulla by two. The boys put in their best 80 minute effort for the season on Monday night against the Roosters as they scored seven tries and never really looked like losing. After the win the week before against the Eels it’s starting to look brighter for the team’s chances of making the finals. Having said that the focus this week has been on the next period of games coming up which includes matches against the Storm and Dragons here at home, so this weekend’s game against the Sharks holds even more importance as a much win match. The teams have come together once already this season with the Raiders getting a big win on the turf of Canberra Stadium but a lot has changed since that day and Cronulla are no longer the defensively weak unit they were that day. Led by their inspirational skipper Paul Gallen the Sharks have had resurgence of late and are well within striking distance of the finals and we know they will come ready to play on Saturday. One player who’s sure to get a less than warm welcome from the Sharks faithful is former Cronulla resident Blake Ferguson, who left the Sharks at the end of last year to come down to Canberra and play with the Raiders. Fergo is a super competitor and has been one of our best so far this season and I know he’ll be fired up for this one and the best way for him to do the talking is by playing a strong game on the weekend and hopefully bagging a couple of four pointers. After watching him Monday night it’s quite obvious that he likes to entertain as he plays and the try he scored where he chipped and chased for himself down the touchline is something Raiders fans can get used to seeing if he stays as confident in his own ability as he does now. The battle for the two points though this week comes down to what’s going on in the middle of the park and Brett White and Dane Tilse will need to be ready to take on the Cronulla props Kade Snowden and Luke Douglas. Snowden and Douglas have set the platform for the Sharks of late and we’ll need to keep them quiet and I think the way Brett White is playing at the moment will be a big factor in this. Whitey has been in great form over the past few weeks and loves starting the games and I expect a big game from him and Dane Tilse. Tilsey starts the game this week after Tom Learoyd-Lahrs was ruled out for the season with a bicep injury and he’ll be keen to show he’s a forward leader, especially with David Shillington still on the sidelines. We wish Tommy all the best in his recovery and look forward to seeing him back in action next year and also I would like to congratulate David Shillington on re-signing until the end of 2015. Cronulla coach Shane Flanagan insists Paul Gallen will defy his rib cartilage problem and play against Canberra at Toyota Stadium tomorrow night. Given its recent injection of youth, Canberra's much-loved moniker, the Green Machine, has never been so apt. TALENTED back rower Jason Bukuya has been rewarded for his good form with a new, two-year contract with Cronulla Sharks. Bukuya, 22, has managed to shake off injuries which dogged him the past 18 months, to this season show why he is so highly regarded in the Sharks big forward pack. A solid defender, Bukuya has also impressed with the ball in hand and has been a regular starter in a back row which has featured Origin captain Paul Gallen, Kiwi international Jeremy Smith and former Test forward, Anthony Tupou. "I've been happy to play without problems and contribute to a winning side," said the Fiji World Cup player. "I think we've turned the corner and been successful the past month because of our attitude, and realising the goals set for us, on and off the field." Bukuya may be forced to dig deep with an injury cloud hanging over Smith (knee) and five-eighth Wade Graham (sternum) for Saturday's 5.30pm game against Canberra Raiders at Toyota Stadium, with the Sharks aiming for four straight wins. "There were a few niggly injuries suffered in our loss to Souths but I think we should all be ok by Saturday," Bukuya said. "Besides, we owe the Raiders one after our round one loss down there." Bukuya's re-signing follows hot on the heels of talented outside back Matt Wright inking a new deal, the Sharks now having re-signed most of their 2011 backs. Canberra's Tom Learoyd-Lahrs joins another big Raiders' forward, David Shillington, on the injured list after a torn biceps tendon ended his season. Dane Tilse has replaced him. Canberra has not named NSW full-back Josh Dugan, but Raiders coach David Furner hinted on Monday he could start. The Harvey Norman Sharks Week comes to an end this Sunday with a $12,000 giveaway at its Caringbah store. Today, between noon and 1pm, fans get the chance to meet the Sharks coaching staff in workshops, with NRL coaches Shane Flanagan, Joey Grima and head trainer Trent Elkin. On Friday, there is pass the ball competitions and on Sunday, 1pm- 2.30pm, meet Sharks' stars Kade Snowden, Chad Townsend, Paul Aiton, Tim Smith and Scott Porter, and meet and dance with the Mermaids before the $12,000 prize draw. I never thought I would say this but good riddance to Origin, now let's get our focus back on the real heavyweights like Cronulla and Canberra. 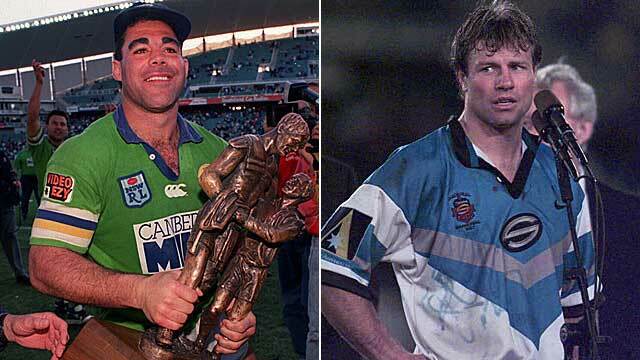 History repeating ... grand final fortunes could decide Sharks-Raiders. The Adjudicator says: "Just a month ago, a trip to the Shire for an NRL team was more like a summer holiday - stroll in, land a few waves, work on your tan and pick up your complimentary two points from reception upon departure. These days, Toyota Park has sides more nervous than a wade in the shallows after watching Jaws. Big Gall has the locals singing I’m A Believer all the way towards an unlikely spot in the eight. But we all know the Sharks have a history of deflating quicker than a blow-up dingy hitting the bottom at Shark Island. They will face a Canberra side brimming in confidence after landing two big wins on the trot. However, the Raiders are more accustomed to the Antarctic conditions of Canberra Stadium and might just leave the Cronulla Resort with nothing more than a burnt backside. The Adjudicator's verdict: "Take this one in carefully fans, so you know what to expect when the first Sunday in October rolls around. With that in mind, only one of these teams knows how to win a grand-final calibre match. Sorry Sharkies, it's Canberra by four." Canberra coach David Furner is confident Blake Ferguson won't be unsettled on Saturday by a hostile reception from Cronulla fans and his former teammates. Ferguson angered Sharks supporters when he left the end of last season, claiming he wanted to join a team with a chance of winning an NRL premiership. Although he has been a standout performer for the Raiders with 10 tries this season, Ferguson's new club sit two places below the Sharks on the ladder, prompting Cronulla coach Shane Flanagan to question his decision this week. However, Furner believes the winger won't be ruffled by his return to Toyota Stadium. "He's an ex-Cronulla player there and there is going to be a bit of hostility toward him but I think, as a group, we need to handle that," Furner said. "I sat down with Blake and spoke to him about his game. "You don't want to take away that flair which can create a try out of nothing but I did talk to him about control. He is learning." Five-eighth Josh McCrone also backs Ferguson, and warns the in-form Sharks, who have won their past three games, not to bother targeting the 21-year-old with high kicks and a volley of verbal abuse. "It will create a good atmosphere. They had a good crowd of around 18,000 last week and, with Fergo coming back there, it will create a bit more interest," McCrone said. "I think they would be a bit silly if they targeted him with bombs. He is one of the best catchers in the comp. "I'd say there will be a fair bit said to him but that sort of thing will be right down Fergo's alley." Both sides need to win the game to keep alive their finals' aspirations and, like the Sharks, the 13th-placed green machine have found some form following a dismal start to the campaign, tasting victory in their past two outings against Parramatta and the Sydney Roosters. However, with a tough run of games coming up in the next two weeks, Furner is aware of the importance of a positive result. "Both Parramatta and the Roosters were a little bit similar to us, down in form and maybe a little bit of confidence," Furner said. "Those two wins for us have put us in a position of being confident but Cronulla are the same. "Over the next three weeks, we've got (the) Sharks, Melbourne and St George so I think last week for us, as I say, is a little bit of a curtain-raiser. "I think we need to be better defensively." Long-serving players continue to lobby for better cap concessions, writes Jon Tuxworth. AFTER the Raiders beat the Roosters on Monday night, skipper Alan Tongue spotted David Gallop saunter into the jubilant dressing room. This was an opportunity the club stalwart wasn't about to let slip. ''Don't worry boys, those extra concessions for long-serving players will be coming in next year,'' Tongue declared cheekily, loud enough for the NRL boss to hear. Gallop glanced at the red-headed warrior and gave him a wry smile. But a seed had effectively been planted. A visit by Gallop to the Raiders sheds is rare. In the NRL, club stalwarts like Tongue are becoming even rarer. The 30-year-old's to-and-fro with Gallop was nothing more than banter. But he's dead serious when he says concessions for staunch clubmen should be increased. ''If you talk to the fans, they like to see players at clubs for a long period of time,'' Tongue said. ''It's what the game needs; it's building those character you associate with the club. The NRL allows $200,000 for each club, to share among players who have played there for at least eight years. That's double the concession in 2010, but Canberra is one of the leading advocates that believe it should be more generous. However, it is unlikely to be reviewed until the NRL's new TV rights deal comes into effect in 2013. ''He [Tongue] did rib me about whether he could be completely exempt [from the salary cap] next year,'' Gallop grinned yesterday. ''[But] it was pretty light-hearted, and came off the back of a pretty good win. Most clubs have looked for an increase in the overall cap, rather than an increase in concessions, but we certainly recognise the importance of long-serving players to clubs. Tongue is adamant something needs to be done, to avoid the notion of one-club icons like Darren Lockyer and Nathan Hindmarsh becoming obsolete. ''We don't get to see David Gallop in the sheds too often. We were happy after the win and it was a chance to stir him up,'' Tongue said. Tongue points to the salary cap squeeze that forced Petero Civoniceva out of Brisbane as a warning shot to address the issue. ''He's been great for Penrith, but I don't think he should've had to go in the first place,'' Tongue said. ''Andrew Ryan's going through the same thing at the moment [at the Bulldogs]. In an age where players now shift from one club to another mid-season, Tongue rates playing for anyone other than the Raiders as ''unfathomable''. He has fielded inquiries from rival clubs in his 12 seasons at the Green Machine, but his loyalty has never faltered. Tongue was approached by the Gold Coast when they re-entered the competition in 2007. Penrith also came knocking. Tonight, Tongue will play against another one-club talisman, Cronulla's Paul Gallen. Their respective teams have endured plenty of lean times of late, but their loyalty is borne from passion for their clubs. ''The reality is not everybody gets those fairytales,'' Tongue said. ''[Josh] Papalii is the 300th to play for Canberra and I was number 211, so I've seen 90-odd players come and go. Cronulla coach Shane Flanagan is also an advocate of greater concessions for long-serving players. ''There's plenty of opportunities for the Paul Gallens and the Alan Tongues to move, but they stick solid and they don't get rewarded enough I believe,'' Flanagan said. ''I haven't really thought about it in any fine detail, but it should be stepped up. I'm not privy to these things because it was before my time, but I can guarantee he [Gallen] was offered opportunities to go elsewhere, but stayed with the Sharks. Flanagan suggested concessions could be tiered after eight years, so they increase each season after that. Gallop agreed the idea has merit. The Raiders are slowly clawing their way back into finals contention and need to keep winning, but they face a tough task against an in form Cronulla outfit this weekend. The Green Machine have lost Tom Learoyd-Lahrs for the season with a bicep injury which gives Sam Mataora a chance to come into the side, with Brett White and Dane Tilse gearing up to lead the Raiders forwards. It's a battle of two pint sized fullbacks this weekend, when Nathan Massey and Nathan Gardner go head to head. Massey had his best game in Green last weekend against the Roosters and showed he knows how to handle NRL footy, while Gardner is arguably the Sharks most dangerous attacking weapon. The match up could read Ferguson v the Sharks supporters, as they're sure to give their former hero plenty of lip from the stands on Saturday. The challenge for Ferguson will be to channel that into a strong on field effort and a try or two will surely do that. Matthew Wright is a strong defender who can save a try so the Raiders will need to get their men outside him. This could also include Brett White and Kade Snowden, with the battle up front sure to be explosive this weekend. Both Tilse and White will step up in the absence of Tom Learoyd-Lahrs and David Shillington so expect plenty happening in the middle of the park. ''I'm expecting sledging [from the Cronulla crowd], they'll be ripping into me. I didn't leave on the best of terms but I'll be looking to have a big game this weekend." I'm thinking that if we win this game we will (not can, but WILL) make the finals and could very well go all the way from there. With our past two wins we have seemed to turn a corner and if we can build on it today it should give the side a massive amount of confidence. Give me Raiders by 12 and Fergs to score first as payback for the sledging from Sharkies faithful. Tough game to win Gall will be fired up after getting flogged on weds..